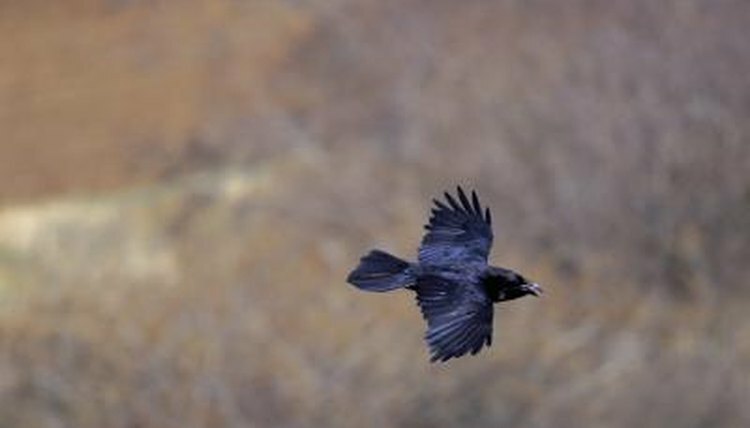 There are several reasons why members of the corvid family, which includes several species of both crows and ravens, might make circles in the air. These large, black birds can be difficult to tell apart from one another, especially at a distance. To ascertain what it might mean when you see such a bird circling a particular area, it helps to know exactly which species you’re watching. The US has three different native crow species. The American crow, whose range covers most of the US and Canada, is the largest, followed by the fish crow, which is found in states along the Atlantic and Gulf coasts from New Jersey to Louisiana. The smallest is the northwestern crow, which sticks to the northern Pacific Coast. There are also two native raven species: the Chihuahuan raven, which is found in the southwestern US and Mexico, and the common raven, whose range covers most of the western US as well as some northeastern states. This species can also be found in the Appalachian Mountains. Crows usually stay closer to the tree tops and fly shorter distances than ravens, who can often be seen gliding on updrafts of warm air called “thermals.” These thermals usually carry birds in a circular pattern. Like other large birds who ride thermals, such as hawks and buzzards, ravens take advantage of these updrafts to rest their wings and help them fly higher and farther than they would otherwise be able to under their own power. Both crows and ravens are sometimes seen deliberately circling smaller areas closer to the treetops. One reason for this is that they might have spotted potential food or prey and are on the hunt. They also might be scoping out the area for predators or competition before landing to eat. During the nesting season, crows with young birds in the nest usually stick close to home and keep a sharp watch out for predators or other potential threats. Crows and ravens have had a long history of ominous associations, dating at least as far back as ancient Rome. They often have been used in literature as omens of death or foreboding. Perhaps this is because of their black feathers, or because they are known to sometimes feed on dead carcasses. While it’s true that sometimes a circling crow is scoping out carrion, and they have been known historically to circle battlefields and other places where people have died, there are other reasons a crow might be circling. There is no reason to assume that this behavior is a portent of death or bad luck.